I have been looking for a diamond tennis bracelet for my wife Katie. Our 25th anniversary is this year. I have already gotten a pearl necklace for her from Stauer, and now I am going to get this diamond aura tennis bracelet for her. The price is right and it looks a lot nicer than the 3 and 4 thousand dollar diamond bracelets I have been perusing at our local jewelers. Keep up the good work Stauer! I purchased this for my wife last year and it still turns heads. Better than expected, how do you do it? Purchased this for my wife for our 1st Anniversary. She was thrilled and so was I. I purchased not really expecting much considering the price. I figured I can return it if it looks cheap. Was I wrong! It looks like I spent thousands and I was amazed how it sparkled when the light hit it. Thanks Stauer, from both my wife and myself! I received this as a gift and I love it! I had purchased a “real” diamond bracelet for myself and returned it when I saw this one! Uniform stones which are very sparkly. It hangs beautifully very drapey. 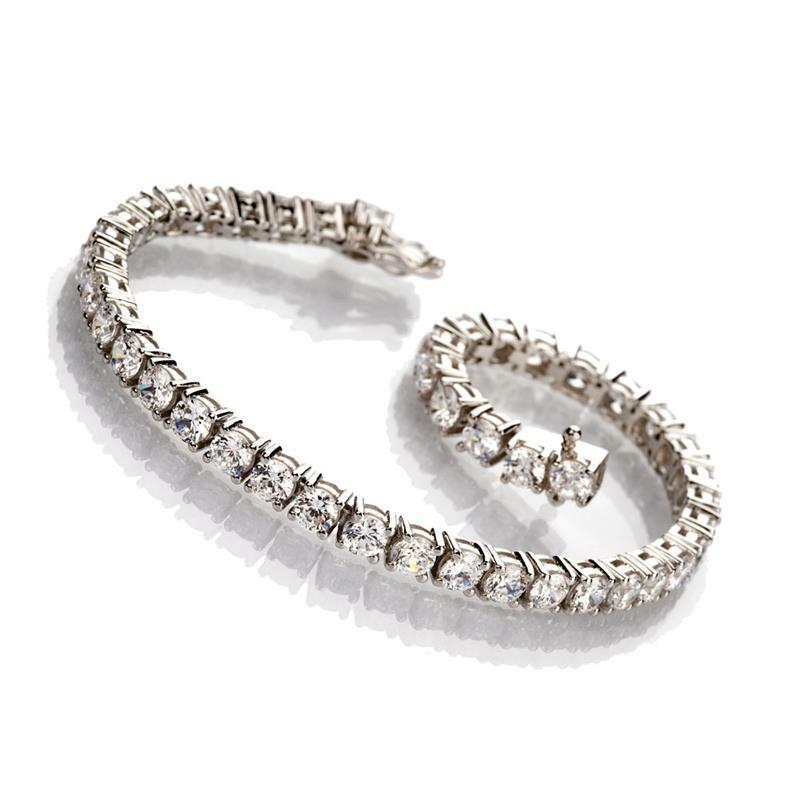 The tennis bracelet purportedly owes both its catchy name and its cachet to renowned champion Chris Evert. During a tennis match at the U.S. open in 1987, play was interrupted when the in-line diamond bracelet she was wearing came off, necessitating a frantic search for the treasured "trinket." And what woman of refined taste would blame her for such priorities? Now this exceptional adornment gets the Stauer Luxury-For-Less imprimatur. We've prong set 42 brilliant-cut, 4mm diamond alternative DiamondAura® (a head-turning 16 4/5 carat total weight) in sterling silver to create the same dazzling look without the dizzying price tag. And to ensure that you don't have an on-court crisis like Chris, we've secured the 7¼" bracelet with a box catch.